Product #49516 | SKU SmartRig II | 0.0 (no ratings yet) Thanks for your rating! 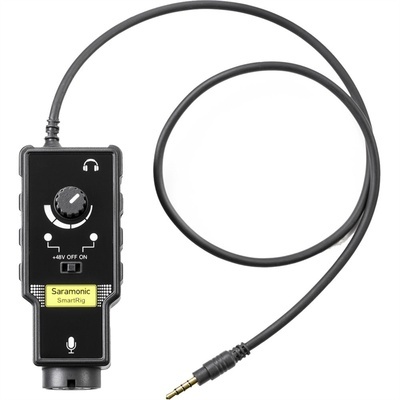 The SmartRig II XLR Mic & 1/4" Guitar Adapter with Phantom Power Preamp for Smartphones from Saramonic is designed to connect any XLR microphone or a 1/4" guitar to your iPhone, iPod touch, iPad, or Android device. It can be used as a high-quality microphone preamp that allows you to capture audio using a professional stage microphone, or a high-end studio microphone for your smartphone device. Furthermore, the SmartRig II has a frequency response of 20 Hz to 20 kHz. It is built with a headphone monitoring jack, but the recording app you use (sold separately) must feature a playback monitoring option, which sends a playback signal in addition to receiving the audio input, for the monitor to be active.